a) Any candidate who has completed Post Graduate Degree (10+2+3+2 or 10+2+5) or Double Degree holders (10+2+3+2 or 10+2+3+2/3) or B.E.,B.Tech. B.Sc. Agri. (10+2+4) under regular course from a college affiliated to a recognized University with 60% of marks and above. b) Candidates who are appearing for the final semester of their Post Graduation - PG from a college affiliated to a recognized University (final exam in May / June 2017) can also apply with aggregate of 60% marks and above without any standing arrears at the time of applying. a. Requisite Application Fee may be paid by online mode only and no other mode of application will be accepted. b. Bank transaction charges for online payment of application fees / intimation charges will have to be borne by the candidate. c. Online Application once registered will not be allowed to be withdrawn and application fee once paid will NOT be refunded under any circumstances nor can it be held in reserve for any other future selection process. The above Test will be available in English. There will be penalty for wrong answers marked in the Objective Tests. For each question for which wrong answer has been given by the candidate one fourth or 0.25 of the marks assigned to that question will be deducted as penalty to arrive at corrected score. If a question is left blank, i.e. no answer is marked by the candidate there will be no penalty for that question. a) Candidates who are eligible, can apply for online examination and qualify for the exam as per the marks and norms stipulated by the Bank. b) Qualified candidates in the online exam will be called for Personal Interview (Date of Interview and Venue will be informed by the Bank to the individual candidates through registered e-mail only). c) Depending upon the number of vacancies, the Bank reserves the right to call only those candidates who have sufficiently high score in the online Examination for Interview. 12 months. Confirmation will be subject to satisfactory performance during probation. a) Candidates are required to apply online through website www.kvb.co.in ( careers page) . is to be kept active. Bank may send call letters for interview to the registered e-mail ID only. 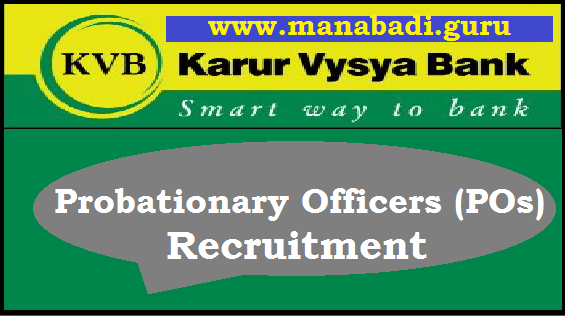 c) Candidates thereafter, open the link available in careers page “PROBATIONARY OFFICER SCALE I CADRE RECRUITMENT 2017” to open the online application form.